1694: born in Ôsaka. 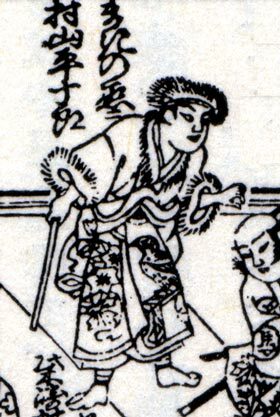 Eldest son of Murayama Heijûrô I, he started his career in Ôsaka in 1702 and his first stage name was Murayama Kinjûrô. 8th lunar month of 1707: his father Murayama Heijûrô I died. Fall 1707: his father was expected to go on tour in Edo in Fall. Kinjûrô replaced him and went to Edo with Murayama Heiemon III. 11th lunar month of 1707: Kinjûrô performed at the Yamamuraza in the kaomise drama "Yukihira Obana Gitsune". 1st lunar month of 1709: Kinjûrô went back to Ôsaka. 11th lunar month of 1711 : he became jitsuaku and took the name of Murayama Heijûrô II in Kyôto, playing the role of Ôaraki Jinnojô in the kaomise drama "Kikenjô" which also celebrated the shûmei of Takioka Saburoshirô. 11th lunar month of 1713: Heijûrô played in Kyôto the role of Nakatomi Makinojô in the kaomise drama "Eitai Kogane no Ichigura", which was produced by Sakakiyama Shirotarô I at Kameya Kumenojô's theater. 11th lunar month of 1714: Heijûrô became tachiyaku and played the role of Hata Rokurozaemon in the kaomise drama "Azuma-zukuri Ôdaidokoro", which was produced at Kameya Kumenojô's theater by Sakakiyama Shirotarô I. 11th lunar month of 1717: Heijûrô played in Kyôto the role of the bashi Washinosuke in the kaomise drama "Genjôraku Biwa no Ôumi", which was produced by Yamatoyama Jinzaemon I in Ebisuya Kichirôbê's theater. Fall 1718: Heijûrô went back to Ôsaka. 11th lunar month of 1718: Heijûrô played at the Higashi no Shibai the role of Ôuchi Kinzô in the kaomise drama "Kogane no Seigaiha", which was produced by Arashi San'emon III. 1st lunar month of 1719: first Kabuki adaptation of Chikamatsu Monzaemon's 1708 puppet theater drama "Keisei Hangonkô" by Kyôya Yagoshirô, which was produced by Arashi San'emon III in Ôsaka at the Kado no Shibai; Heijûrô plays the role of Kanô Shirojirô Motonobu [casting]. 11th lunar month of 1721: Heijûrô appeared on stage for the last time in ôshibai, in Ôsaka at the Higashi no Shibai, where he played the role of Bantate Jûzô in the kaomise drama "Tenryû Chiryû Kogane no Suzunari", which was also produced by Arashi San'emon III. 1st lunar month of 1722: Heijûrô's last ranking in the Ôsaka hyôbanki, tachiyaku section, was jô-jô-(shiro)kichi (superior - superior - (white) excellent). He shared the same rank with Sugiyama Kanzaemon III, Tamiya Shirogorô, Sengoku Hikosuke I and Nakamura Shingorô I. No record afterwards. Murayama Heijûrô II was a Kamigata actor, who was active from the beginning of the 1700s to the beginning of the 1720s. He was able to perform a wide range of roles, as a tachiyaku, a katakiyaku or a jitsuaku. He was said to be more at ease in jidaimono than in sewamono. He excelled in budôgoto and in yatsushigoto. He was also a talented musician. His tsûshô was Ichiemon. In the latest edition (2012) of "Kabuki Haiyû Meiseki Benran", it was written that he took the name of Murayama Heijûrô II in the 11th lunar month of 1709. We've decided to stay in line with Nojima Jusaburô's book "Kabuki Jinmei Jiten".